Apiezon greases M, N, and L are specially designed for vacuum use, however, they are also beneficial across various other applications. Examples of other common uses include industrial and scientific, amongst many others. To remove Apiezon greases, simply wipe away with a lint-free cloth. Should any residue remain, warm, soapy water will remove the grease. For further cleaning, we recommend using Limonene, a safe, hydrocarbon solvent. The Apiezon grease with the best vapor pressure is type L, in that its pressure properties of all hydrocarbon products can be used in applications requiring ultra-high vacuums. Apiezon greases M and N, on the other hand, can be used in high vacuum conditions. 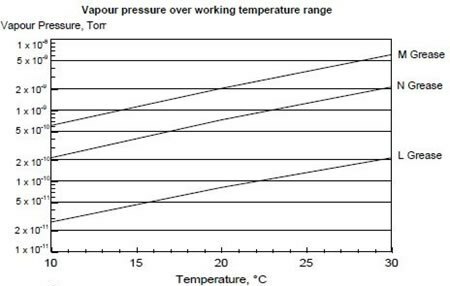 The graph below illustrates the vapor pressures for each of the three grease types over its working temperature range. Greases M, N, and L are generally used within ambient temperatures. Note that Apiezon grease type N is recommended as the grease of choice for researchers, scientists, microscopists, and other professionals alike, for optimal results in cryogenic vacuum use. Within the Apiezon Grease Type N formula is a unique additive that gives it a firm, rubbery consistency, providing a cushioning effect that absorbs any vibrations or any other movements in the unit for which the grease is being used. Note: Apiezon Grease Type N is not recommended for use with delicate materials such as glass-to-glass joints. The risk of fracture is high and therefore type N is unadvised. Apiezon Greases Type L and M both contain special properties that allow for optimal lubrication. This characteristic guarantees a reliable seal for a number of vacuum pumps. Note: Type N, though an excellent lubricant, should not be used for cryogenic temperatures. We do, however, recommend using this type in ambient temperatures. Apiezon greases, hydrocarbon-based, are very resistant to moving from the area of application, contrary to common belief with silicone-based products. Though silicone has the tendency to move from the area of application, rest assured that with the use of Apiezon Grease, this problem will not occur. This resistance of moving from area of application benefits the user on that it significantly reduces the chance for contaminants to enter application areas as well as reduces the risk of infrared and mass spectrometry interferences. Note: Though the risk of silicone contamination can be avoided, it must be made aware and understood that in applications involving surface coating such as paints or metals, trace amounts of silicone on such surfaces can interfere with the paint adhesion, thus significantly affecting final coverage results. With use of Apiezon hydrocarbon greases, such aforementioned problems can virtually be avoided. Apiezon greases L and M are halogen-free, which, when degrees of radiation are shown, only produce a small increase in viscosity when irradiated with 4MeV electrons to about 100 Mrads. Apiezon greases are manufactured from feedstock that contains a high proportion of branched and unsaturated structures. These structures give the greases high molecular weight and significant absorption abilities. Strong absorption abilities ensure that these greases have a strong gettering action; for example, the power to absorb greasy residues on metal and glass surfaces. Did you know what Apiezon greases L and M are often used as the stationary phase in gas chromatography due to their strong absorption capabilities?